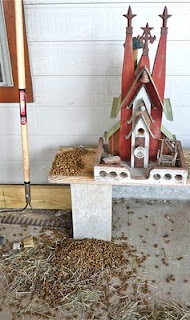 I called from the porch into the house, "Why is there dog food in the birdhouse?" When geeks live together, it's best to ask questions first before messing with something that appears to be an experiment or otherwise out of the ordinary. I was hosing bird droppings off the front porch, a.k.a. "the poop deck*", when I lifted the birdhouse and food started coming out. "Why is there what?" Spouse looked outside the door. "Dog food? Oh, I thought you said dog poo!" 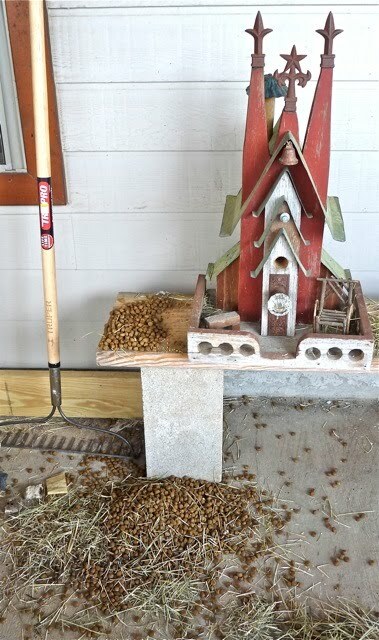 I poured the rest of the kibble out of the back of the birdhouse. Scratch grains came tumbling after the kibble, and then a small, abandoned mud-dauber's nest. "I bet there's a bird hiding away this food," says Spouse. "Can you imagine how long it took to load all this?" There were at least three cups of kibble stored inside. *phrase courtesy of Natalie, who has a chicken and a wonderful geekly family, and writes about them over at Chicken Blog. The emergency generator is now fully installed! It may have taken longer than I would have liked, but thankfully there was no need for it during the winter freezes. The side yard goose pond's old pump has been replaced with a pump that can (hopefully) keep up with the poo-producing capacities of our geese. Attended our first chicken show, where our neighbor's daughter had four entries. So many cool-looking breeds! Glad I didn't bring a carrier, as it would have been tempting to purchase a few to take home. Spouse saw a Golden Phoenix/Ameraucana cross-bred rooster (gorgeous! 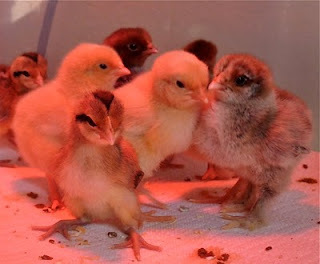 ), and is idly considering getting an Ameraucana roo to breed with our new Golden Phoenix pullets. Then last, but not least: we're renting the backhoe/digger again for an upcoming weekend's worth of projects. 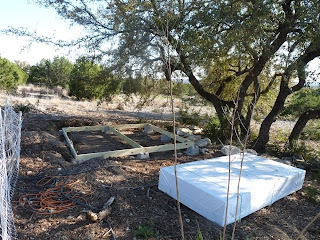 There's fruit trees to plant, trenches to fill, paths to re-gravel, and much mulching to be done. I feel rather geeky to admit I'm looking forward to working with heavy machinery :-). In the meantime, however, I need to rest up. I'm sure Miss Cecily will oblige my efforts. If bossiness is any indicator, Miss Cecily may be on the mend. 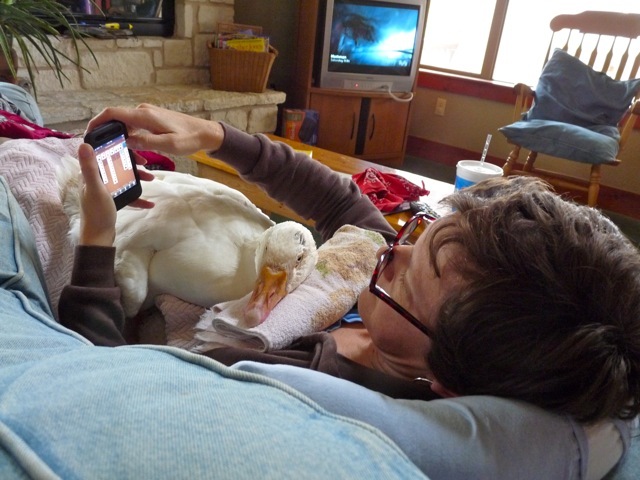 If the feeding tube is within beak's reach, it is attacked. If there's something of interest on the coffee table - and within beak's reach - it will get nibbled. If her soon-to-be-patented "Put me on your chest, it's nap time, human!" stare is not acted upon by one of us, the other human is then set upon. Repeat until one of the humans give in. It's not enough to let her out with the other geese - one of the human pillows must be there as well, or caterwauling will commence. On a more serious note, she's walking more, and keeping her head upright for longer periods of time. She had a four week run of taking DMSO, and has been off for almost two weeks without relapse. She's not only molting, but is growing in new feathers. She's yet to put on weight - the stress from molting and new feather output takes up a lot of calories - so her smoothie feedings* are now four times a day. I've been able to space out the vitamin shots to 72 hour intervals without noticeable energy lag on her part. 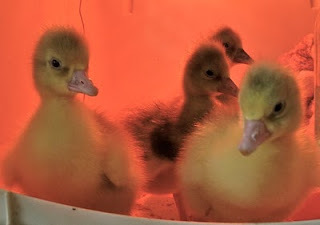 Hoping that once the new feathers are in, she'll quickly start recovering full flexibility and strength. In the meantime, however, if being spoiled rotten is any indicator of health, Miss Cecily is well on her way to full recovery. Stick-blend a handful of kale in a cup of water; strain & save juice. Approx half cup+ of chick feed, ground into a powder. Mix together, and let sit for at least an hour so the grains can soak up some of the liquid. Stick blend again, adding more water if necessary to obtain a soupy consistency. We didn't plan it this way, but perhaps it's a blessing for it to happen so soon after Godzilla's passing. We just got in our order of new goslings and chicks. Four more Tufted Roman females, six buff Wyandottes, and the "surprise pullets" were two each of Brahmas, Fayoumis, and Gold Phoenix. Love them fuzzy butts! 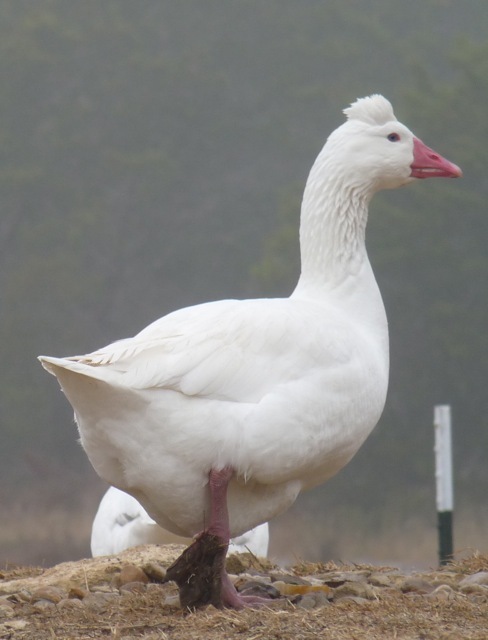 Of course, this means Billy-Bob the gander is going to have a total of nine female geese to mind, but I don't think he'll "mind" at all. Miss Cecily's sweetheart, Godzilla, passed away early this afternoon. I had noticed him breathing a bit heavily on Saturday, and made plans to take him into the vet on Monday. Monday, his breathing was much worse. While at the vet getting tests done, he passed away. 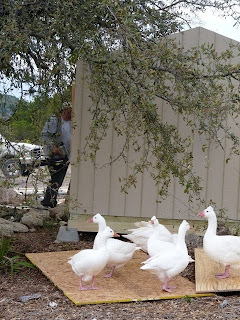 An autopsy will be performed to find out the cause, to make sure what happened isn't a disease that is/was communicable to the other geese. Godzilla was one our two first hand-raised goslings. He was a sweet, sweet boy (except during mating season, of course). Although Tufted Romans are harem-minded, not mate-for-life types, he and Miss Cecily were always close. He and Billy-Bob both liked to come inside the house to visit Miss Cecily in her recovery area, or hang outside the porch next to the screen door and nap close by. 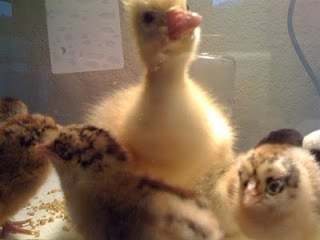 Billy-Bob has some big webbed feet to follow. Rest in peace, Godzilla. 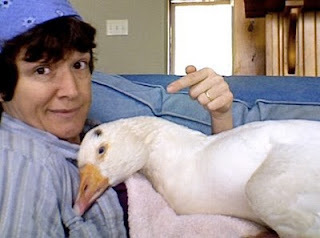 Special note to Ma Nature: enough illness and death for now, okay? 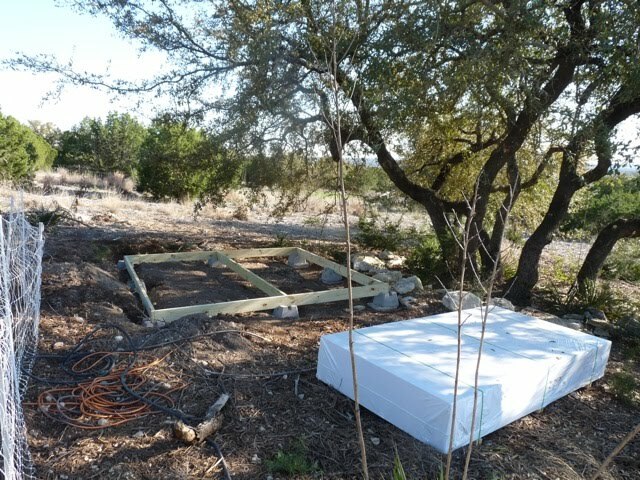 It took Spouse and Uncle almost a full day to to trim space under the oak and make a level foundation. 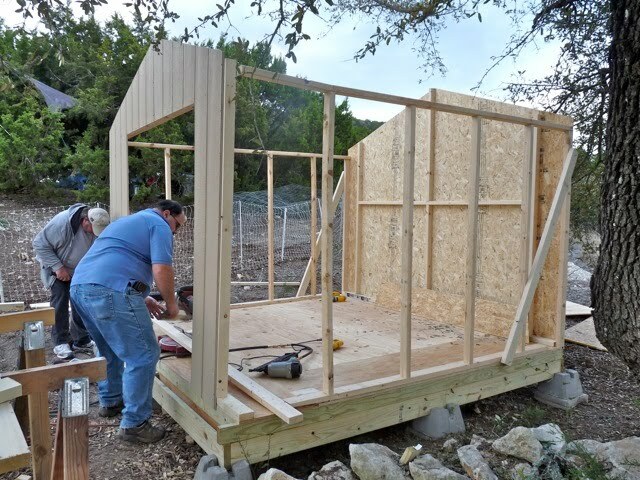 Okay, that would have been the case for the pallet shed, too. Still, an ugly surprise: I hadn't noticed that the shed used 2x3's instead of 2x4's, and the terrible thinness of the plywood siding. Spouse and Uncle were up to the challenge, however, even if the budget wasn't prepared. Off to the hardware store for more lumber! The shed with skylight cut in. Two window openings will be cut into the west and east sides each, with the northern front (door side) to remain closed against winter rain and wind. 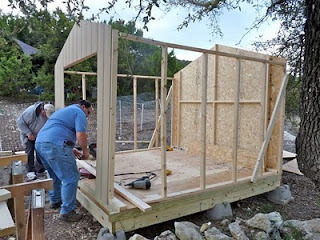 The south side may receive windows as well, but we'd have to attach some sort of awning to block against southern rain. 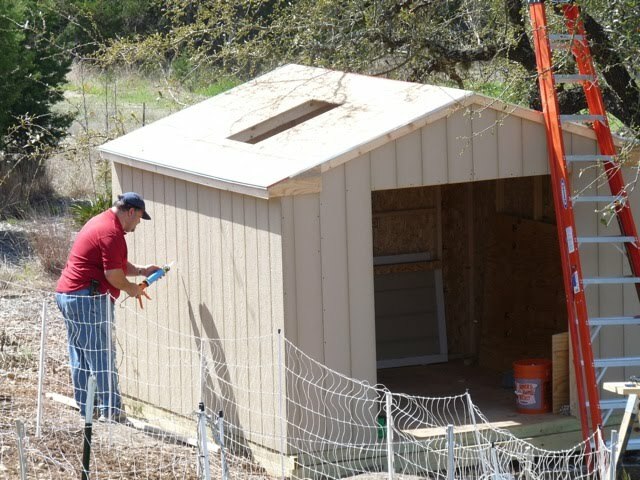 The coop will receive eastern morning sunlight, but by noontime, the shed will be shaded against the afternoon heat on the west side by the oak tree under which it resides. 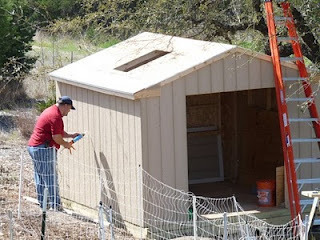 Next: corrugated roofing, and painting the inside.